Pretty Southern is proud to announce our membership in the Atlanta Food Bloggers Society. 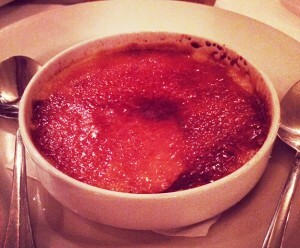 We just attend our first event at Horseradish Grill, and we’re still stuffed full of Southern goodness! First Course: Pimento Cheese Grit Fritter, Country Ham Aioli, Homemade B&B Pickles; a Fried Fish Filet with Garlic Chips and Alabama White Sauce; plus a Fried Green Tomato topped with Goat Cheese, Spiced Pecans and drizzled with Remoulade. 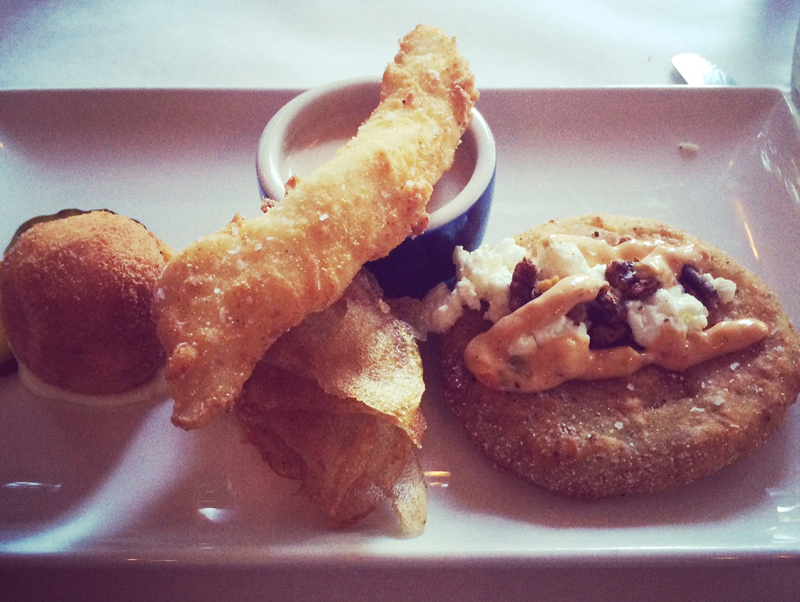 This was a perfect Southern sampler. Second Course: Shrimp & Grits. Seriously y’all – this is one of the best samplings of Shrimp & Grits I’ve had in Atlanta. 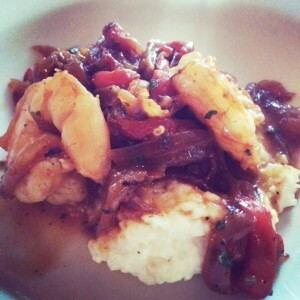 The sherry sauce with peppers and onions over fresh shrimp and Logan Turnpike Mill Grits. 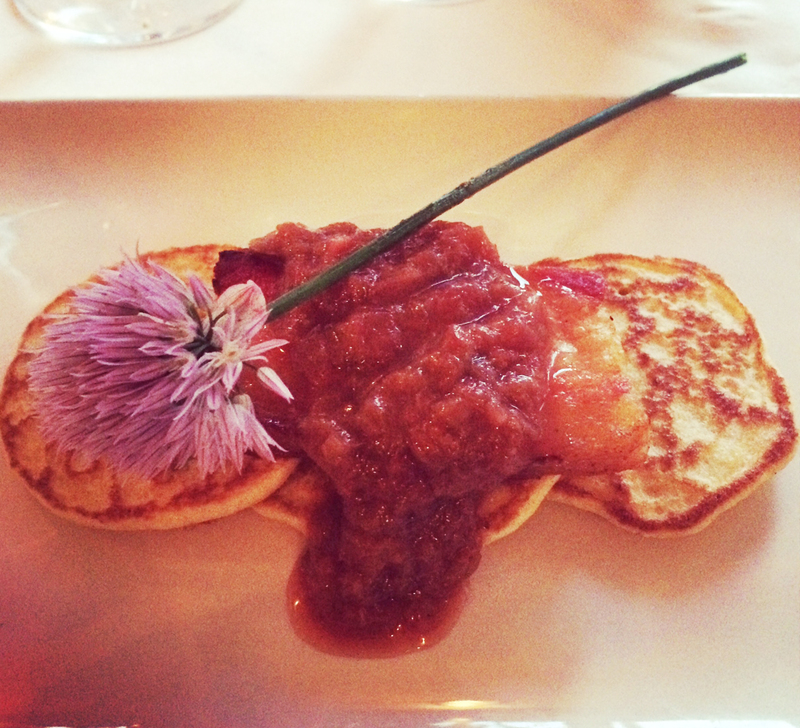 Third Course: Braised Pork Belly served over cornmeal pancakes with a rhubarb red onion jam topped with a chive flower fresh from Horseradish Grill’s own garden. 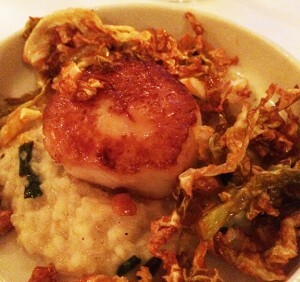 Fourth Course: Pan seared sea scallop over Carolina gold ride middlins with skillet scallions (think Southern risotto) topped with fried Savoy cabbage, black eyed “peanuts”, and drizzled with a BBQ vinaigrette. Fifth Course: Wood grilled HRG dry rubbed ribeye (which was more like a filet mignon it was so perfectly cooked) served with parmesan fries and a smoked garlic corn sauce. 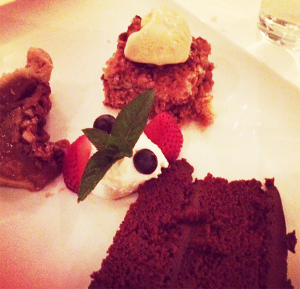 For dessert, we sampled a trio of treats including Chocolate Cake, Pecan Pie, and Spiced Apple Crumble topped with ice cream. Oh yeah, and we shared a sweet potato crème brûlée. 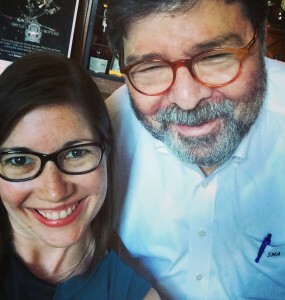 Steve Alterman – proprietor of Horseradish Grill – and yours truly snapped a #selfie. Thanks to Steve Alterman, his head chef Dave Barry, and the amazing team at Horseradish Grill for showing us some true Southern hospitality! 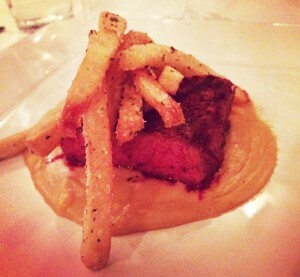 For more information about Horseradish Grill, check out their website, Twitter, and Facebook. WOW! Everything looks SO delicious! Congrats!